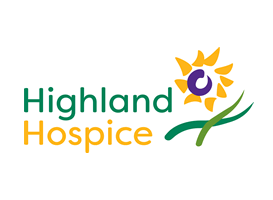 At Highland Hospice we aim to support people, their families and carers, living with an advancing, life shortening illness in the Highlands to live the best possible life and to prepare for and experience the best possible death. By managing pain and other physical symptoms, we help make time and space for reflection, for gaining perspective and for achieving a measure of calm and tranquillity. Crucially, our team also offers advice with the emotional, social and spiritual issues that may arise and works with patients and loved ones at a time of transition to help them enjoy, value and commemorate life. By delivering and sharing our skills in our Inpatient Unit and Day Therapy Centres, in local hospitals and care homes and at home, we seek to provide our patients and their loved ones with respect, dignity and choice both during the patient’s illness and into bereavement. Highland Hospice is committed to the principles of equality and diversity and our services are offered free of charge to all adults in the Highlands. We are an independent local charity reliant on our community and your contribution of time or money, as a volunteer or donor, can make a meaningful difference to people when they need it most. Please support your Highland Hospice.